In 1958 my mother got married and moved across the country. These are the letters written to her, mainly by her mother, between 1958 and 1960, as well as other artifacts from my family's past. Others in the series are in my del.icio.us file. There are no letters from my grandmother during the summer of 1959 so I'm sort of flitting around in the archival material of letters and cards that I do have - and there are plenty. My Grandpa Calvin was born in rural Indiana and raised in the northern part of the lower penninsula in Michigan. He and his siblings learned how to grow and procure their own food through farming and hunting. Grandpa particularly loved to hunt and was good at it. It was an activity that he continued throughout his lifetime. By the time I was growing up, Grandpa had a farm in southern Michigan and he regularly hunted in his own woods. He and his son, my uncle, hunted mainly rabbits, pheasants, the occasional wild turkey, fox and even deer. 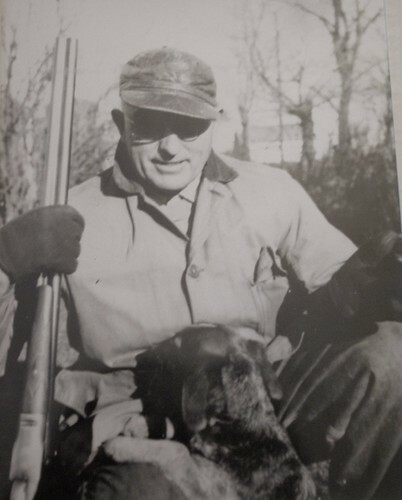 Grandpa was particularly skilled at hunting with a good hunting dog, the kind that would find the prey for him to shoot and then bring it back to him. Over the years as I remember, he had quite a few - King, Sport, Duke, and Lady to name a few. They hunted for him and were rewarded with pats and treats, and a cozy homemade dog house, fresh well water and occasional table scraps. He loved his dogs and they loved him. In his late 70s Grandpa had it in his head that he really wanted to enjoy what time he had left by hunting rabbit. He knew how to fix a tasty rabbit stew and he enjoyed preparing it. But at that time he did not have a good hunting dog. One day, while hob nobbing with his fellow farmers at their favorite restaurant, The Green Nook, he let it be known that he was looking for a little pup that he could train to accompany him during the next hunting season. One of the farmers had a brand new litter of the puppies. He said that the mother and the sire had been a good hunting dogs and he expected that the offspring would be too. Grandpa went out to the man's farm and picked out the most alert pup from the litter. He named her, Babe. All that spring and summer he took care of Babe. Got her to the vet for a check up and all of her shots. He walked all over the farm with her and even shot off his gun a few times to get her use to it. He knew he would have to train her a little bit when hunting season got there, but for the most part, he was hoping that her natural instincts would kick in and that she would be able to sniff out and surprise a few rabbits! On the first day of hunting season, Grandpa and Babe set out on the big rabbit adventure. Babe sniffed the ground and wagged her tail excitedly, but they didn't find any rabbits that day... or the next. or even the day after that. In fact Babe walked by a whole next of rabbits and didn't seem to know or care. When Grandpa was finally able to shoot one, he showed it to Babe and even let her have some of the meat, but she really didn't seem interested at all. Grandpa was a little disheartened and a little miffed. After all that time and energy, this pup was nothing more than a glorified pet. He was going to give her one more try, but if she didn't put out a rabbit on their next trip, he was going to take her down to the pound. That morning Grandpa put on his hunting jacket and grabbed his gun. Babe was wiggling and waggling at his feet. She knew that she was going for a nice long walk and would be able to run and jump in the fields and she loved that. She really enjoyed her time alone with Grandpa, and she was absolutely clueless that this would probably be the lat time. The two walked out by the woods and trudged through the field. Grandpa had his shot gun down by his side; he wasn't even really thinking about hunting. He didn't think he would even see a rabbit that day. All of the sudden Babe stopped cold. Grandpa had never seen her do this before. She was stopped and was focused like a laser beam at a clump of grass a few yards away. Suddenly she took off at top speed straight for the grassy clump and within seconds a flock of pheasants scurried into the air. As one of the startled bigger pheasants attempted to make a hasty ascent, Babe jumped straight in the air, brought it down and killed it. Then holding the limp bird in her mouth, Babe proudly pranced back to Grandpa, dropped the bird at his feet and jumped happily into his arms where she proceeded to lick his hands and face. "Oh, I see," said Grandpa, "You're a bird dog!!" So it wasn't quite the way he had planned it, but from that moment on Grandpa quit hunting rabbits and started hunting pheasants. Sometimes he even managed to get off a shot before Babe brought the bird down, killed it, and brought it back! And although he didn't have the pleasure of hunting himself, he soon found great pleasure in bragging about his bird dog and showing her off.